Oracle last recompiled EPM 11.1.2.4 on April 18, 2018, and branded the new release as EPM 11.1.2.4.900. This updated release is the only version available for download on Oracle eDelivery, and it was published without fanfare or a press release in late April 2018 or early May. This hearkens back to the 11.1.2.0 release, when there was no migration path. The vast majority of Oracle customers who wanted to upgrade from 9.x or 11.1.1.x wisely choose to wait until 11.1.2.1 was released, and I'm going to recommend that 11.1.2.4.900 be avoided for anyone who utilizes Hyperion Financial Reporting. Let's review the pros and cons. The "Reporting Analysis Framework" node is completely missing. 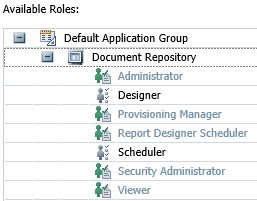 Security provisioning for Financial Reporting is now tucked underneath "Default Application Group". The "Explorer" role is removed. I do like the fact that the number of roles has been significantly reduced, so eventually my position on this will change from "Con" to "Pro", but only after Oracle rolls out a future patch or release that provides a migration path from 11.1.2.4.70x and prior. Migrating reports from 11.1.2.4.70x into 11.1.2.4.900, via File->Import in Workspace, appears to work, but the reports do not render properly. Certain members within the reports are instead displayed as the text “UNDEFINED EDGE CELL”. This must be why the 11.1.2.4.900 README states "create new applications" - I suspect they really mean "create new reports from scratch". This would be a deal-breaker for many of my clients. For now, I advocate that anyone wishing to upgrade to 11.1.2.4 from a prior release open an SR with Oracle, requesting the pre-11.1.2.4.900 version of the eDelivery download media. The exception to this would be a pure Essbase-only play, where Financial Reporting isn't in scope. Thank you dave for the valuable information shared with us.